Drilling holes is a common operation in the airframe repair shop. Once the fundamentals of drills and their uses are learned, drilling holes for rivets and bolts on light metal is not difficult. While a small portable power drill is usually the most practical tool for this common operation in airframe metalwork, sometimes a drill press may prove to be the better piece of equipment for the job. 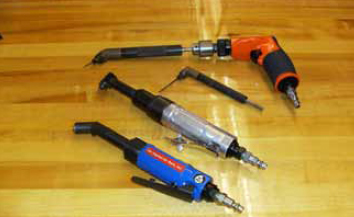 Portable power drills operate by electricity or compressed air. 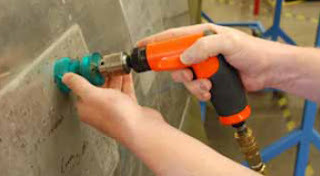 Pneumatic drill motors are recommended for use on repairs around flammable materials where potential sparks from an electric drill motor might become a fire hazard. When using the portable power drill, hold it firmly with both hands. Before drilling, be sure to place a backup block of wood under the hole to be drilled to add support to the metal structure. The drill bit should be inserted in the chuck and tested for trueness or vibration. This may be visibly checked by running the motor freely. A drill bit that wobbles or is slightly bent should not be used since such a condition causes enlarged holes. The drill should always be held at right angles to the work regardless of the position or curvatures. Tilting the drill at any time when drilling into or withdrawing from the material may cause elongation (egg shape) of the hole. When drilling through sheet metal, small burrs are formed around the edge of the hole. Burrs must be removed to allow rivets or bolts to fit snugly and to prevent scratching. Burrs may be removed with a bearing scraper, a countersink, or a drill bit larger than the hole. If a drill bit or countersink is used, it should be rotated by hand. Always wear safety goggles while drilling. 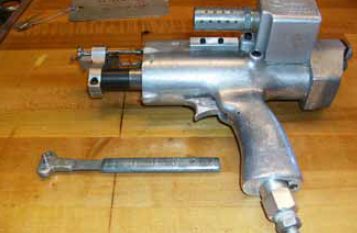 Pneumatic drill motors are the most common type of drill motor for aircraft repair work. 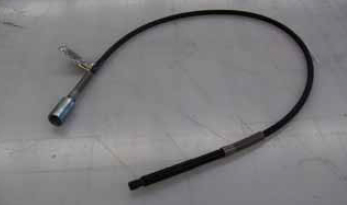 [Figure 1] They are light weight and have sufficient power and good speed control. 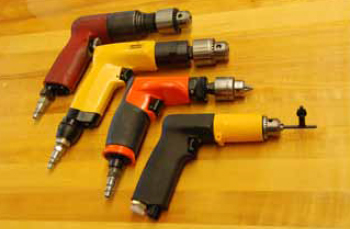 Drill motors are available in many different sizes and models. Most drill motors used for aircraft sheet metal work are rated at 3,000 rpm, but if drilling deep holes or drilling in hard materials, such as corrosion resistant steel or titanium, a drill motor with more torque and lower rpm should be selected to prevent damage to tools and materials. When using a drill press, the height of the drill press table is adjusted to accommodate the height of the part to be drilled. When the height of the part is greater than the distance between the drill and the table, the table is lowered. When the height of the part is less than the distance between the drill and the table, the table is raised. After the table is properly adjusted, the part is placed on the table and the drill is brought down to aid in positioning the metal so that the hole to be drilled is directly beneath the point of the drill. The part is then clamped to the drill press table to prevent it from slipping during the drilling operation. Parts not properly clamped may bind on the drill and start spinning, causing serious cuts on the operator’s arms or body, or loss of fingers or hands. Always make sure the part to be drilled is properly clamped to the drill press table before starting the drilling operation. The degree of accuracy that it is possible to attain when using the drill press depends to a certain extent on the condition of the spindle hole, sleeves, and drill shank. Therefore, special care must be exercised to keep these parts clean and free from nicks, dents, and warpage. Always be sure that the sleeve is securely pressed into the spindle hole. Never insert a broken drill in a sleeve or spindle hole. Be careful never to use the sleeve-clamping vise to remove a drill since this may cause the sleeve to warp. Example: At what rpm should a 1⁄8-inch drill turn to drill aluminum at 300 sfm? When access to a place where drilling is difficult or impossible with a straight drill motor, various types of drill extensions and adapters are used. Select the shortest drill bit that will do the job. It is easier to control. Check the drill bit for straightness. A bent drill bit makes an oversized hole and may whip, making it difficult to control. Keep the drill bit under control. Extension drills smaller than 1⁄4-inch must be supported by a drill guard made from a piece of tubing or spring to prevent whipping. A straight extension for a drill can be made from an ordinary piece of drill rod. The drill bit is attached to the drill rod by shrink fitting, brazing, or silver soldering. Angle adapters can be attached to an electric or pneumatic drill when the location of the hole is inaccessible to a straight drill. Angle adapters have an extended shank fastened to the chuck of the drill. The drill is held in one hand and the adapter in the other to prevent the adapter from spinning around the drill chuck. A wide variety of drill bits including specialty bits for specific jobs are available. Figure 6 illustrates the parts of the drill bit and Figure 7 shows some commonly used drill bits. High speed steel (HSS) drill bits come in short shank or standard length, sometimes called jobbers length. HSS drill bits can withstand temperatures nearing the critical range of 1,400 °F (dark cherry red) without losing their hardness. The industry standard for drilling metal (aluminum, steel, etc. ), these drill bits stay sharper longer. Typically, the procedure for drilling holes larger than 3⁄16 inch in sheet metal is to drill a pilot hole with a No. 40 or No. 30 drill bit and then to oversize with a larger drill bit to the correct size. The step drill combines these two functions into one step. The step drill bit consists of a smaller pilot drill point that drills the initial small hole. When the drill bit is advanced further into the material, the second step of the drill bit enlarges the hole to the desired size. 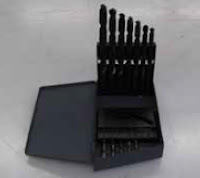 Step drill bits are designed to drill round holes in most metals, plastic, and wood. Commonly used in general construction and plumbing, they work best on softer materials, such as plywood, but can be used on very thin sheet metal. Step drill bits can also be used to deburr holes left by other bits. Cobalt alloy drill bits are designed for hard, tough metals like corrosion-resistant steel and titanium. It is important for the aircraft technician to note the difference between HSS and cobalt, because HSS drill bits wear out quickly when drilling titanium or stainless. Cobalt drill bits are excellent for drilling titanium or stainless steel, but do not produce a quality hole in aluminum alloys. Cobalt drill bits can be recognized by thicker webs and a taper at the end of the drill shank. Easily the most popular drill bit type, the twist drill bit has spiral grooves or flutes running along its working length. [Figure 8] This drill bit comes in a single-fluted, twofluted, three-fluted, and four-fluted styles. Single-fluted and two-fluted drill bits (most commonly available) are used for originating holes. 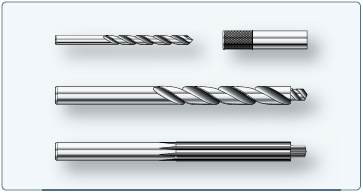 Three-fluted and four-fluted drill bits are used interchangeably to enlarge existing holes. Twist drill bits are available in a wide choice of tooling materials and lengths with the variations targeting specific projects. 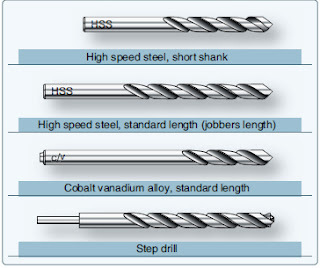 The standard twist drill bits used for drilling aluminum are made from HSS and have a 135° split point. Drill bits for titanium are made from cobalt vanadium for increased wear resistance. Drill diameters are grouped by three size standards: number, letter, and fractional. The decimal equivalents of standard drill are shown in Figure 9. Normal drilling of sheet material does not require lubrication, but lubrication should be provided for all deeper drilling. Lubricants serve to assist in chip removal, which prolongs drill life and ensures a good finish and dimensional accuracy of the hole. It does not prevent overheating. The use of a lubricant is always a good practice when drilling castings, forgings, or heavy gauge stock. A good lubricant should be thin enough to help in chip removal but thick enough to stick to the drill. For aluminum, titanium, and corrosion-resistant steel, a cetyl alcohol based lubricant is the most satisfactory. Cetyl alcohol is a nontoxic fatty alcohol chemical produced in liquid, paste, and solid forms. The solid stick and block forms quickly liquefy at drilling temperatures. For steel, sulfurized mineral cutting oil is superior. Sulfur has an affinity for steel, which aids in holding the cutting oil in place. In the case of deep drilling, the drill should be withdrawn at intervals to relieve chip packing and to ensure the lubricant reaches the point. As a general rule, if the drill is large or the material hard, use a lubricant. 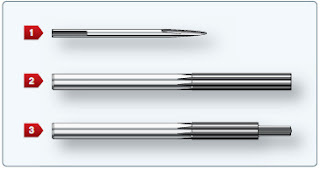 Three or four fluted production bullet reamers are customarily used where a finer finish and/or size is needed than can be achieved with a standard drill bit. Piloted reamer, with the end reduced to provide accurate alignment. The cylindrical parts of most straight reamers are not cutting edges, but merely grooves cut for the full length of the reamer body. 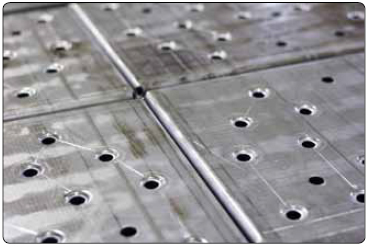 These grooves provide a way for chips to escape and a channel for lubricant to reach the cutting edge. Actual cutting is done on the end of the reamer. The cutting edges are normally ground to a bevel of 45° ± 5°. Reamer flutes are not designed to remove chips like a drill. Do not attempt to withdraw a reamer by turning it in the reverse direction because chips can be forced into the surface, scarring the hole. A spring drill stop is a wise investment. [Figure 11] Properly adjusted, it can prevent excessive drill penetration that might damage underlying structure or injure personnel and prevent the drill chuck from marring the surface. Drill stops can be made from tubing, fiber rod, or hard rubber. Standard—fine for drilling flat stock or tubing/rod; uses insert-type bushings. 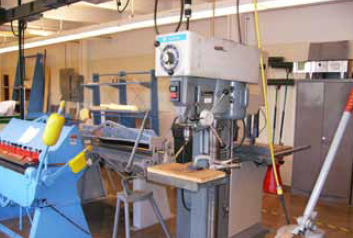 Plate—used primarily for interchangeable production components; uses commercial bushings and selffeeding drills. Arm—used when drilling critical structure; can be locked in position; uses interchangeable commercial bushings. Measure and lay out the drill locations carefully and mark with crossed lines. NOTE: The chisel edge is the least efficient operating surface element of the twist drill bit because it does not cut, but actually squeezes or extrudes the work material. Use a sharp prick punch or spring-loaded center punch and magnifying glass to further mark the holes. 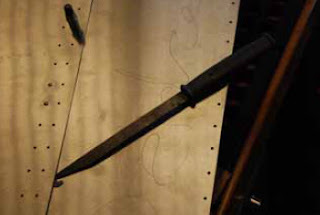 Seat a properly ground center punch (120°–135°) in the prick punch mark and, holding the center punch perpendicular to the surface, strike a firm square blow with a hammer. Mark each hole with a small drill bit (1⁄16-inch recommended) to check and adjust the location prior to pilot drilling. For holes 3⁄16-inch and larger, pilot drilling is recommended. Select a drill bit equal to the width of the chisel edge of the final drill bit size. Avoid using a pilot drill bit that is too large because it would cause the corners and cutting lips of the final drill bit to be dulled, burned, or chipped. It also contributes to chattering and drill motor stalling. 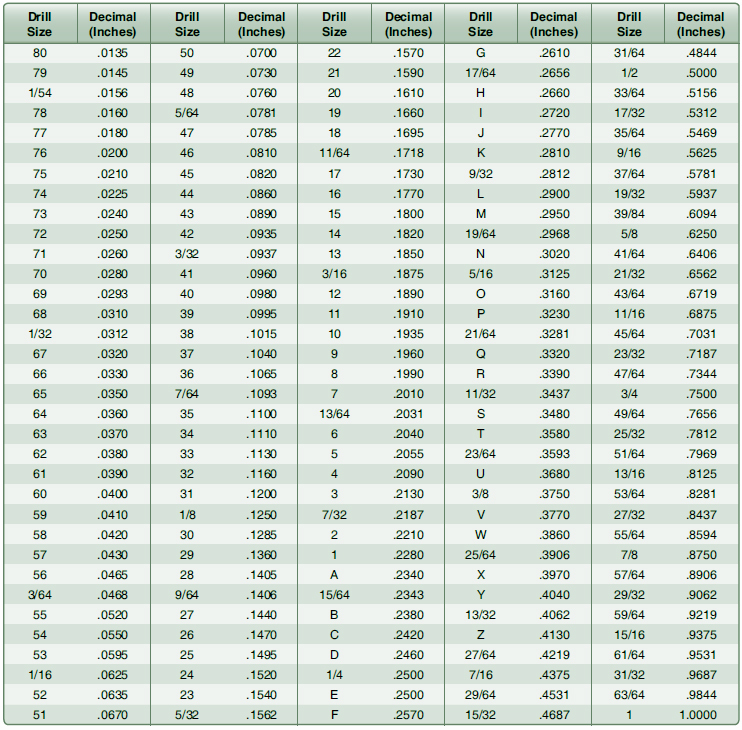 Pilot drill at each mark. Place the drill point at the center of the crossed lines, perpendicular to the surface, and, with light pressure, start drilling slowly. Stop drilling after a few turns and check to see if the drill bit is starting on the mark. It should be; if not, it is necessary to walk the hole a little by pointing the drill in the direction it should go, and rotating it carefully and intermittently until properly lined up. Enlarge each pilot drilled hole to final size. Pilot drill using a drill bushing. 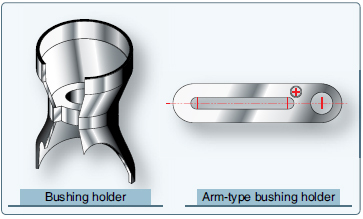 Bushings are sized for 1⁄8, 3⁄16, or 1⁄4 drill bits. Step drill bits are used to step the hole to approximately 1⁄64-inch smaller than the final hole size. The aligning step diameter matches the pilot drill bit size. Finish ream to size using a step reamer. The aligning step diameter matches the core drill bit size. Reamers should be available for both clearance and interference fit hole sizes. NOTE: Holes can also be enlarged by using a series of step reamers. The chip chaser is designed to remove chips and burrs lodged between sheets of metal after drilling holes for riveting. [Figure 16] Chip chasers have a plastic molded handle and a flexible steel blade with a hook in the end.